Exercise SIMUL was an operational exercise designed to test a range of multi-agency plans to respond to an emergency situation centred on a catastrophic landslide, in the Ironbridge Gorge area, Telford, Shropshire. 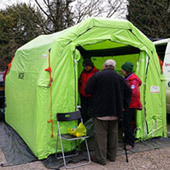 Organised by Shropshire and Telford and Wrekin County Volunteers Emergency Committee and Shropshire Fire and Rescue Service, along with representatives from the voluntary organisations. 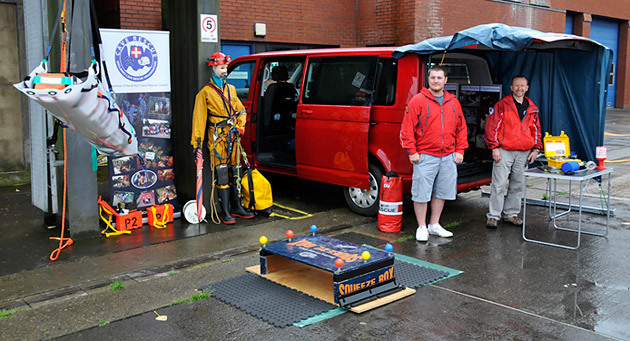 Despite a damp and blustery day visitors to the Telford Fire Station Open Day were treated to a range of fun and informative demonstrations aimed at promoting safety. The aim of the practice was to get team members to perform roles that they normally don't do (with assistance and advice from the more experienced members). Despite the nervousness of those who were put on the spot, the exercise went very well and the problems that were encountered were successfully overcome. A number of team members attended the MREW AGM in Lancashire, not just representing MCRO but wearing a number of British Cave Rescue Council 'hats'. Held at Tweedale Fire Station, there were no changes to the committee this year with officers agreeing to stand again (at least for another year!). So the committee remains as: Mike Clayton; Chairman, Andy Kennelly; Secretary and Graham Smith; Treasurer. Another training session was arranged to cover the assembly and use of the Larkin frame, which has been provided by the government funding through Mountain Rescue England & Wales. Rescue warden Graham Smith had recently attended a training weekend organised by the British Cave Rescue Council and passed on a number of useful pointers and safety items which had been covered during the course to team members who came to this evening session. 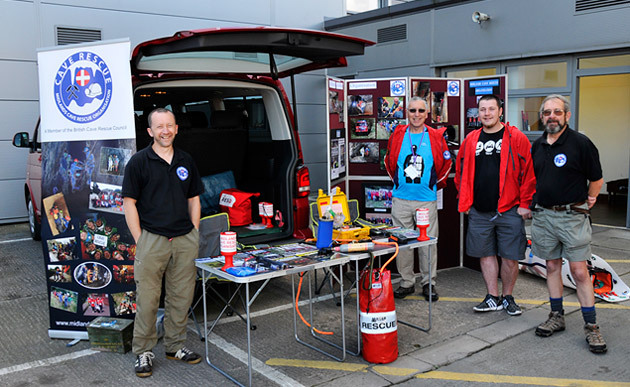 Several team members attended the British Cave Rescue Council pre-AGM Technical day at Buxton Fire Station and the BCRC AGM the following day. Delegates to the Technical day were brought up to date a variety of topics including, SARCALL and development of the new Nicola radios. Our Second evening training session of 2016 was an introduction to GPS and navigation techniques lead by Ian Cooper. 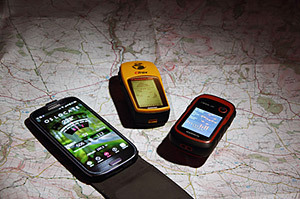 Team members were asked to bring along their GPS devices and Smartphones, then following a brief introduction to the concepts of GPS and satellite technology, team members were sent on a navigation exercise in the surrounding area in which they had to locate certain features and answer questions about items are various locations. It was a well planned and very enjoyable exercise. Team members who attended the session expressed an interest having another similar session - perhaps out in the countryside with an aim of navigating between underground features. During 2016 we decided to make use of the offer from Shropshire Fire and Rescue Service to use their Tweedale Community room to hold a series of evening training sessions. The first session was aimed at introducing the team to the new Slix 100 rescue stretcher and comparing it with our older stretchers and Casualty bags. We kicked off the New Year with our annual training day at Total Access (UK) Limited's excellent training centre, Eccleshall. The workshops covered a variety of techniques from rigging techniques, to communications, equipment familiarisation and a 'first aid' quiz.